Attendance Bundle Stickers. It is so much easier to sell to LIVE customers! The more people you have to your parties or shows, the more sales you will have! Use these stickers on your invitations to draw attention and create interest in attending and bringing friends! 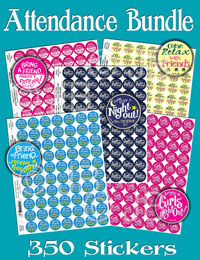 This Bundle includes 5 sheets (total of 350) of premium, eye-catching shiny stickers. Graphic shows sheets and enlargements of the individual design slogans. These graphics are designed to work with both sides of the brain, the colorful designs draw people to read them, and then, because of the graphic designs, the subconscious part of the brain will read them over and over again with just a glance. **Individual items are subject to change based on availability. They would be similar usage and value.